As someone who bikes this area, I don’t see a huge benefit from this piecemeal path and don’t think it will make that area much more bikeable than it already is. Considering S Saunders and Florence st. between Cabarrus and Lenoir are already very pedestrian friendly, pretty streets to bike with very limited automobile traffic, and the alley between Lenoir and South is already bikeable, I would rather see this money and planning energy being spent on a greenway along Lake Wheeler around the perimeter of Dix connecting the Rocky Branch trail to the 2 park entrances along Lake Wheeler, and the farmers’ market. I access this area from my home on the outside of 440 on Lake Wheeler. I bike down the 6′ sidewalk to Centennial Parkway, cross the busy intersection there, and then trudge up and down the blind hill of L.Wheeler with cars flying by. As far as I’m aware there is no plan to add sidewalk/greenway along Lake Wheeler as it will probably be included in the Dix master plan and be built in a far off year. Rosengarten path controversy is very justified. Crossing street intersections 7 times in a half mile stretch is counterintuitive to the purpose of a greenway. You can cross intersections only 5 times by staying on sidewalk. Very disappointed to see city planners skimp on this. other than extremely localized neighborhood walking, the rosengarten path isn’t much use and thats ok. bikes and other uses can use streets and sidewalks much more efficiently. the path can be used if you want to meander along the creek and it satisfies that end. seems okay to me. Yes, it does satisfy a creek walking experience. I love creek restoration projects and think Raleigh needs to daylight and clean the many beautiful rocky creeks that it has. I.e. Totally looking forward to Devereux Meadows. But as far as connecting Dix park to downtown and the residential areas just south of 440 (my neighborhood et. al.) And more broadly improving the connectivity of the city, this project is inconsequential IMO and could be better utilized elsewhere, like bridging West Street together per the blog post. Although I’ve heard getting railroads to cooperate on an at grade pedestrian crossing is near impossible. 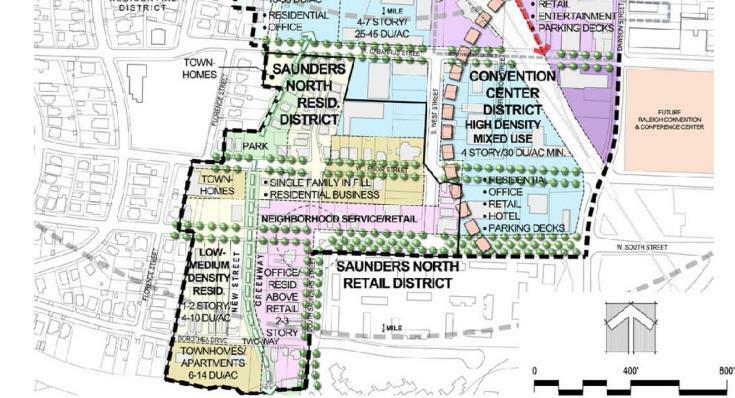 Anyways, If it’s going to happen I hope they get it done quickly and move on to something that will offer more utility to visitors and residents. 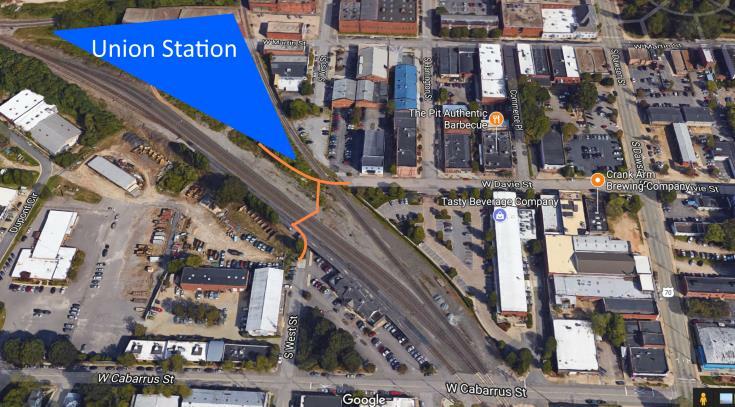 Start the greenway at Boylan Bridge (which has pedestrian-ready sidewalks), cross the bridge southward, turn west on Mountford toward the tracks, and parallel a well-lit greenway with the railroad toward Dix? Either cross the tracks via the existing Mountford bridge-to-nowhere and ramp down to be at-grade with the tracks, or ramp down short of the bridge to parallel on the east side of the tracks. At Western, ramp down again to hook up with the existing Rocky Branch Trail @ the terminus of Cabarrus St. At that point, bikers could either ride east on Dorothea Dr. or west to cross Western via Hunt Dr. (Although a pedestrian bridge parallel to the RR bridge to Dix would be ideal!!!). Anyway, using Boylan Bridge as the jumping-off point would connect the Glenwood South people via Boylan and would connect the DT/Warehouse people via Hargett. 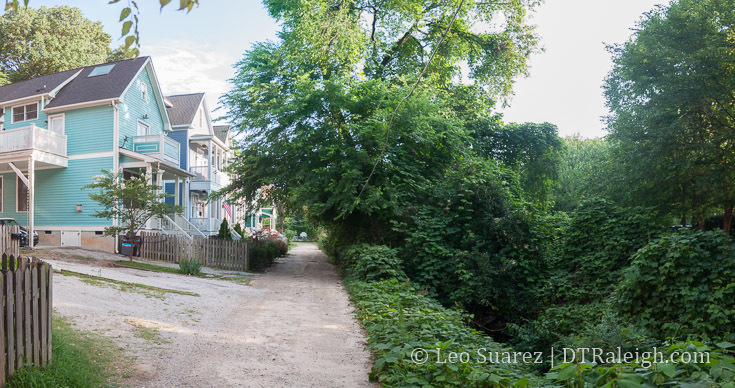 I realize there are issues with RR easements, so maybe this would never work, but it just seems like there are way too many property owners to please with the Rosengarten plan; cutting through different properties, crossing several streets, etc. just seems “choppy” to me. I like the idea of following the RR. An alternative could be to follow the tracks SE from Union Station to a shared use path or two-way protected bike lane along Dawson. From there the path could continue around Heritage Park to connect to S. Saunders near the Western Avenue Bridge and the Rocky Branch Trail. 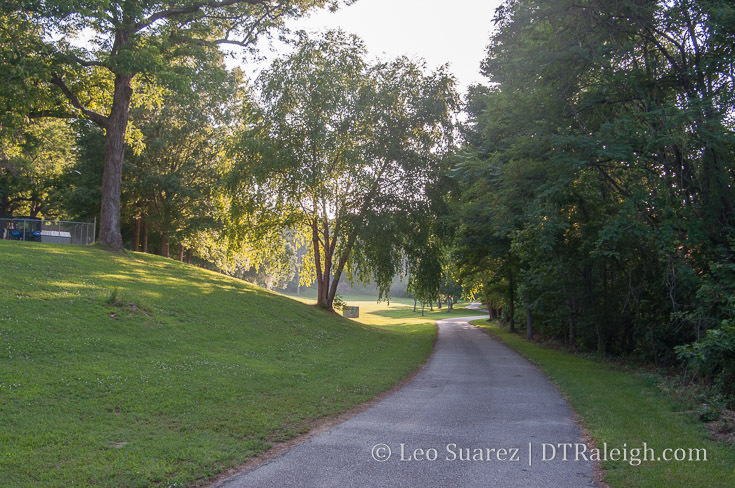 A path or trail of some sort along Lake Wheeler Road seems like a no-brainer as well. While I agree that connecting West St. should be the highest priority of funding for the area to make Dix more accessible to the public, I am not holding my breath for it to happen. The RR is more like to close more streets than to open a new one. 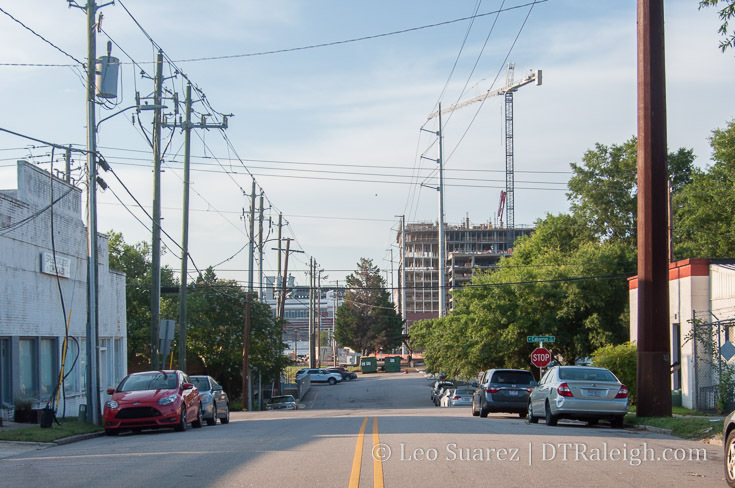 They already want to close Jones and didn’t they also include Hargett on their hit list? If they close Hargett, it will really isolate Boylan Heights and further reduce their traffic in conjunction with the moving of the train station to the other side of the tracks. 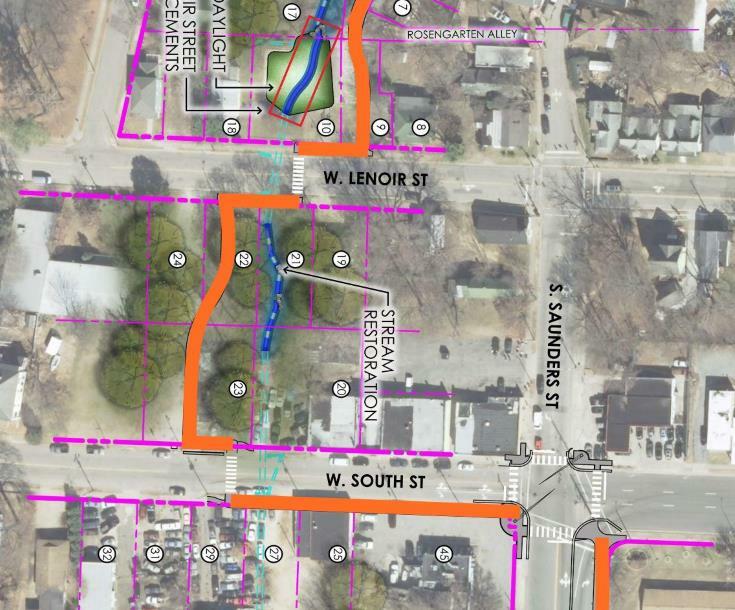 It would seem to me that Boylan ought to be the path from the west side of DT to Dix for bikes and pedestrians. @Tico, how did you get 7 crossings? From Cabarrus to Rocky Branch Greenway I only count 4. 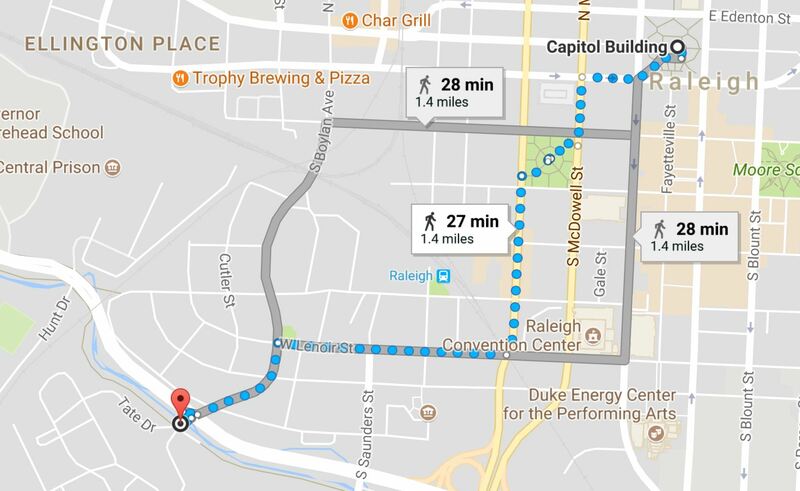 It’s only 3 if the path were to go along West Street and connect to the Saunders Greenway, so that seems like the safest and most logical option to me. That’s also much more direct. A greenway along South Street in front of Heritage Park could be a nice DT to Dix connector. Although, there’s a bike there now so it’s not really needed. Looks like Charlotte.. is getting yet another taller building.. 35 stories. Must be nice..
Who knows, maybe the new City Hall building/complex will offer a tall building? Robert , the last rumor that I heard was something around 20 stories ! This was 1 year ago ! Debating the merits (laced with some preference and opinion too of course) of things is pertinent and constructive. Being a fanboy of one thing and an anti-fanboy of another just makes you a hypocrite. Back on topic; Can we redo Western Blvd? I think it’s a huge problem. Historically MLK was Smithfield Road. 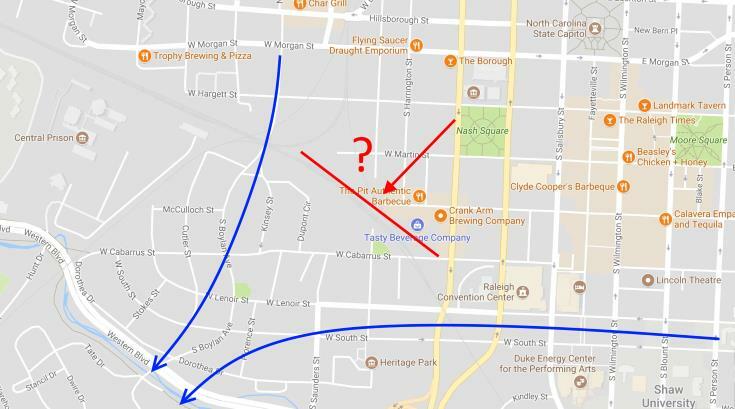 That could have been paired with Dorthea (Historcally Boylan Drive, and Cannon St which once punched through downtown along Kinsey and on to Worth), all the way from say Boylan Ave or Florence to Rock Quarry. Alas, what to do now though…? I think replacing the whole interchange of MLK/Western/Saunders with street grid would greatly improve downtown’s connection to Dorthea Dix. But just saying that is a huge simplification…wetlands, maintaining the Saunders primary arterial capacity and such all must be dealt with. But I am dismayed that this interchange even exists and will never be discussed for removal. Whats the latest on the N&O site? I forgot to add it to the article, just did it now, but if you want to know more about Raleigh Bike Share, make sure to listen to this interview on Inbound Raleigh. Everyone talking about either building a new bike path in the existing RR right-of-way or adding an at-grade bike/ped crossing should take a deep breath and start on new ideas. The railroads are dead-set against this kind of thing and I’d bet my house it’d never happen. Ever wonder why there’s no sidewalk across Hargett at the tracks? That’s because the railroad doesn’t have to build them and doesn’t ever want to encourage people to walk there. At that location they can’t stop people but that doesn’t mean they have to make it easy. So that’s a big enough issue for them, forget building anything else. The railroads hate at-grade crossings for cars (as someone pointed out previously) so why in the world would they want people walking to cross. Plus they tightly hold on to their right-of-way for future expansion (When in the future? Who knows, could be 70 years) and they’d have to give or sell it to the city for that to happen. I’d like this to work out just as much as the next cyclist, but using or crossing the railroad land should be dumped as an idea. The only way across are current crossings, tunneling under or bridging over. This may be true for the private railroad corridors but not the NCRR. I find changes to the NCRR happen more frequently than the CSX or NS corridors. The state owns the area around west st so there is hope. @DBDowntowner I think there’s a misunderstanding about my post. At no point do I think there should–or could–be an at-grade crossing or interference with the RR right-of-way. My thoughts were to parallel the RR just adjacent to their right-of-way. Either using the Mountford bridge to get over to the west side of the tracks (between prison and tracks) or paralleling on the east side. When I said “at-grade” in my previous post, I was referring to ramping the greenway down from Mountford to the level of the tracks so it wouldn’t be an elevated path…but still staying clear of their right-of-way. It just seems to me that finding space immediately outside of RR right-of-way makes more sense than cutting through a bunch of back yards like Ferris Bueller. @Leo, there’s hope but I’m still skeptical. While NCRR is a “public” company (technically they’re private but the only shareholder is the State of NC) they’re still beholden to the contracts they have with the freight co’s that use their tracks as well as a myriad of other things that get in the way of them being a public entity as we usually think of it. So hope, but be cautious. Also, which properties around West St. are you referring to that the state owns? I looked on iMaps and didn’t see any.